ITC Galaxy Pearls are a squad of eight girls between the ages of 6-8 from five area local elementary schools. They are coached by Mallori Johansen and Brooke Anderson. Back row (l-r): Coach Anderson, Reece Bryson from Hillsboro Elementary, Layken Slack from Hillsboro Elementary, Gabriella Crowe from Brown County Christian Academy, Ashlynne Clifton from Brown County Christian Academy and Coach Johansen. Front row (l-r): Baillee Combs from Russellville Elementary, McKenslee Cooper from Peebles Elementary, Chloe Pierson from Hillsboro Elementary and Emma Schweickhart from Sardinia Elementary. 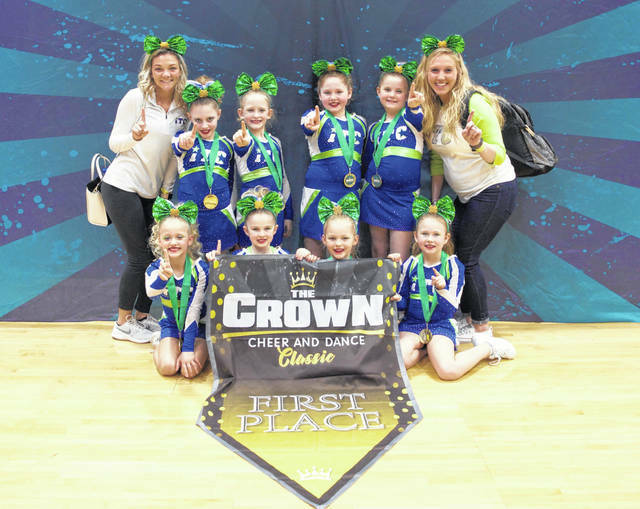 Inspire Training Center’s Galaxy Pearls Cheer Team is set to compete at the 2019 The One Cheer and Dance Finals on March 30-31 at Kalahari Resort in Sandusky, Ohio. ITC Galaxy Pearls are a squad of eight girls between the ages of 6-8 from five area local elementary schools. They are coached by Mallori Johansen and Brooke Anderson. “These eight little girls give me their best each and every week. They are one of the hardest working teams I have ever been blessed to coach. But the best part is watching their pure joy in the sport, and when they realize their dedication has paid off. We have competed in seven competitions throughout Ohio and Kentucky bringing home 1st place at four events, a 3rd place and two 4th places. This end-of-season event, is exclusive to teams that are among the best in their division and only those teams that earn a bid, qualify to compete. This team earned their bid to compete in the Mini Level One division and I couldn’t be more proud” said Coach Mallori. This story was submitted by the Inspire Training Center.